Actvity Summary: Examine sediment photographs to observe and recognize patterns in the core. In this exercise your students will be asked to make observations about marine sediments. Cores of sediment are obtained by drilling into the seafloor by a scientific ocean drilling research vessel, the JOIDES Resolution. 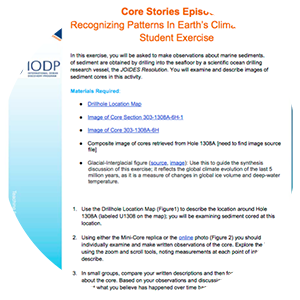 Students will examine a series of photographs of sediment cores in this activity. The photographs range from a close-up of a particular interval of one core, to the whole core, and then to the whole sequence of cores from a single drilling location. Moving across this range of scales will allow students to expand their observations and recognize patterns. The last task asks students to compare their core observations to relevant global climate data and develop hypotheses on how the patterns they observed in the cores may have been driven by cyclic global climate change.